From comments I’ve heard from foreign businesspeople and from my own observations, I find that Vietnamese women are very dynamic, not only the younger ones but also middle-aged women. When the “doi moi” economic reforms were introduced in 1986, a new level of freedom was given to private enterprises and women have been quite dynamic in seizing the opportunities. I remember speaking with an Indian businessman who came to Vietnam. He told me it was clear to him that Vietnamese women, including businesswomen he dealt with and women he worked with, were quite strong. I understand his sentiment, as women are prepared to make decisions without hesitating when it is necessary. They are also prepared to take responsibility for the decisions they make. Vietnamese women are resilient in times of crisis. A 2016 report from the Credit Suisse Research Institute, “The CS Gender 3000: The Reward for Change”, surveyed more than 3,000 of the largest companies globally to determine the differences women’s participation on boards of directors bring to a company’s management and business results. One finding was that at a time of crisis, women on boards help stabilize the business and help it successfully navigate the crisis. That’s the type of influence the resilience of female entrepreneurs can bring to their business. Another aspect is reliability. Of course, there are exceptions here and there, and I’m not saying that no women are corrupt. Overall, though, there’s a great sense of reliability when it comes to women in terms of trying to avoid mismanagement and corrupt practices. And I believe that trust and reliability are very important in today’s Vietnamese business world, when there are a lot of challenges and changes. Women are always eager to learn and to advance, to make progress. It’s very clear from the time they are in higher education at universities or colleges that many women are eager to learn. And I think the same applies on the job, as they can have a positive impact on the way a business is managed. In the context of global economic integration, Vietnamese businesswomen need to also study science, technology, engineering, and mathematics, or what is called STEM education. Too few women are currently going into technology, and we need to do so more and continue to learn and adapt, to provide models for other women. In the globalized world, the pace of change is quite rapid and the nature of change is complex, so women need to continue learning and adapting. They also need to proactively network and connect with different partners in this globalized world and identify opportunities inside and outside of Vietnam. It’s important in today’s world to communicate effectively. Women have an advantage in this regard, as it seems to me they are better communicators than men. But they need to continue lifting the level and effectiveness of their communication skills to make the most of this natural advantage. Women should also study and promote what is called open management, which means bringing greater effectiveness and connections within the system. It goes against the so-called top-down kind of hierarchical management. This type of management is flexible and tends to develop everyone’s ability and dynamism. Women should take the lead in open management and not be afraid of it or act against it. This is a new style of management that is suitable as the fourth industrial revolution (Industry 4.0) takes hold. 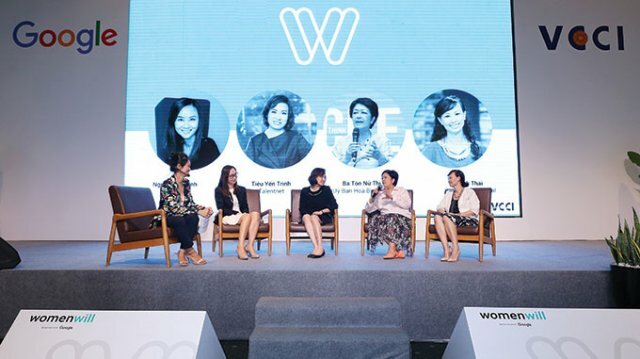 The first solution for Vietnamese women leaders to take full advantage of modern technology to build on their skills and inspire them to successfully run their enterprises in Vietnam’s fiercely competitive environment is to focus on science and technology and education. The second is being adaptable, as Industry 4.0 is a new concept for many and perhaps particularly businesswomen, especially those that are of middle age. The third is the importance of method over memory, as the latter becomes less important as everything needed is on the internet. What’s more important is information processing; how you select information to serve your needs, and methodology makes a difference in the ocean of information available on the internet. That’s why, for example, you can test job candidates by studying the methods they use to access the internet and find information. This is what I call understanding versus knowledge. Knowledge of facts and figures is not as important as understanding how to find them and be aware of new trends and challenges. You need to identify what information is secondary or not reliable or trustworthy, identify trends and challenges, and determine what is happening, what is new, what will become a new model, what will be morally important, and so on. Further, the approach should be systematic, and female entrepreneurs need to be able to see the big picture and how everything is integrated and connected. Women should be able to focus, as focus is increasingly important in today’s whirlpool of events and changes. As for the opportunities, one is knowing how to observe and understand Industry 4.0, which will enable you to accelerate the growth and development of your business, and if you gain a position of advantage you can move and lead faster. A few years ago, I read a Grant Thornton report that put Vietnam with China, Thailand, and the Philippines in the top ten countries in Asia for women CEOs. China and the Philippines have now moved higher than Vietnam on that score but what we need to underline is that most women CEOs are in small and medium-sized enterprises (SMEs), while large enterprises are still mostly led by men. I think Vietnam is well-positioned in this regard but we should not be complacent, because China is doing very well and the Philippines is doing even better than we are. In ASEAN, we should be careful and make sure we don’t fall behind, not just the Philippines but also Thailand and Malaysia. I can offer some advice. The first is to stay cool, know where you stand and what your level of understanding is. You have to know where the competition is and how you’re related to the competition. You need to know where your business is, how large it is, how successful it is, and what the biggest challenges and opportunities are, while being clear about your strengths and weaknesses. The second piece of advice is to be impactful in three dimensions. Try and create your own difference, and this has to be a real difference, not something superficial. The impact you make should be meaningful. There must be positiveness in your impact, because you may have an impact but if it’s not positive or meaningful, then you’re not fully successful. Thirdly, sustainability. Make sure that your impact is not just an impact today but also tomorrow. ■ What do you think about the role of female CEOs during Industry 4.0? Female entrepreneurs are increasingly asserting themselves and the contribution by women-owned enterprises is increasing. Forecasts from many studies suggest that, in the future, more than 50 per cent of businesses around the world will be owned by women. It has been said that the driving force of the global economy is China, India, and the internet. With information technology being applied during Industry 4.0, however, the most important driving force is women. The world is entering into Industry 4.0, which affects two key stakeholders: micro, small and medium-sized enterprises, and women. This is a great opportunity for women to be owners and guide the digital economy, contributing to Vietnam’s economic development. In recent years, female-owned businesses have accounted for a quarter of all businesses in Vietnam. We still see fewer female entrepreneurs than male entrepreneurs. But in recent global awards, the number of Vietnamese women entrepreneurs being honored is equal to the number of men. 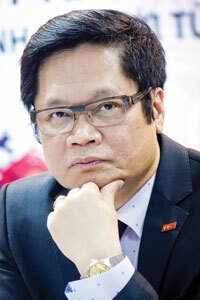 ■ What are the advantages and disadvantages for female CEOs in Vietnam? Women are generally more cautious than men. They are also more sensitive and economical, which is important in business. This means female-owned businesses have the ability to develop more sustainably. It is clear that the majority of women work at small and medium-sized enterprises (SMEs) and they often employ female workers and are engaged in more social activities. Thus, they not only contribute to GDP growth but also to poverty reduction, agricultural development, and the development of rural areas. These have not just economic benefits but also social benefits. However, female entrepreneurs in Vietnam have to cope with barriers in the business environment. We have not exploited the potential of our people in general, including the potential of women. How to promote the role of women, the recognition given to women, and the mechanism for women to participate in socioeconomic activities have not been given adequate attention. There must therefore be incentive policies for female entrepreneurs. ■ What policy suggestions would you make to the Vietnamese Government to support female CEOs? Vietnam is recognized as a country with a tradition of respecting women and pursuing gender equality. The global economy is in the process of restructuring under the influence of Industry 4.0 and gender equality and women’s empowerment are needed. We need to adopt smarter, more female-friendly economic policies.